At St. John's, children are not only taught to embrace and celebrate learning as a joyous, lifelong pursuit, but to proudly and courageously apply what they know, across all aspects of their lives. 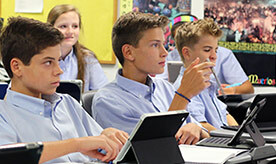 Our students take pride in their accomplishments, develop their natural curiosity and awaken an inner-drive to think independently, critically, and creatively. Through exploration, play, creativity and collaboration, St. John’s students develop a deep love for the learning process. And when children love to learn, they will thrive throughout life in an unpredictable world. 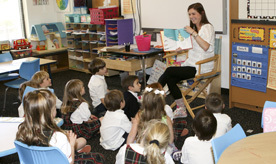 At St. John’s, we have intentionally designed the Pre-k-8 journey to maximize each child’s foundation of knowledge, courage, leadership, and service.